Have you ever tried to make your own ice cream? If you haven’t, you are going to be pleasantly surprised at how easy it really is. You can really let your imagination run wild with the flavourings you add to home-made ice cream. 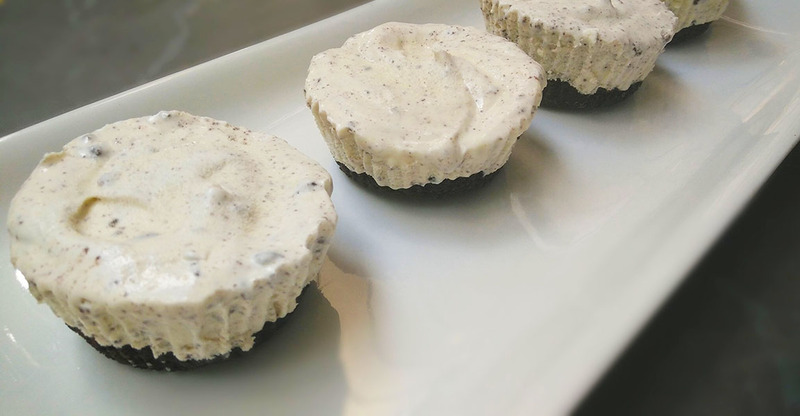 These Cookies and Cream Ice Cream Pies have become a favourite way to add delicious flavour and texture to our homemade ice cream. Oh, let’s not forget the most important part…YOU DON’T NEED AN ICE CREAM MAKER…and it is a NO CHURN RECIPE. Believe me, once you get the taste of homemade ice cream, shop bought will feel extremely boring. The first 4 ingredients in this recipe make just a basic vanilla flavoured ice cream. This is how I prepared my first ice cream. It was just all mixed together and placed in a metal loaf tin to set for 2 hours in the freezer and turned out with a divine creamy, rich flavour. It was amazing. So you can try it out this way as well. But adding cookies, fruit, nuts or berries to this recipe and setting it in different shapes makes a really impressive dessert. In this recipe, I used twenty Oreo cookies. The Oreo cream is first separated from 16 of the cookies. The cream is scraped off 16 of the cookies and is crushed to form a base for the ice cream pie. I just place it in a ziplock bag and crush it with a rolling pin. You could also put it into a food processor as well if you prefer. It is then mixed with a little butter to help it all stick together … ?Haha, doesn’t that sound crazy… we bash it with a rolling pin to break it up and then we go and add butter to stick it all back together again. 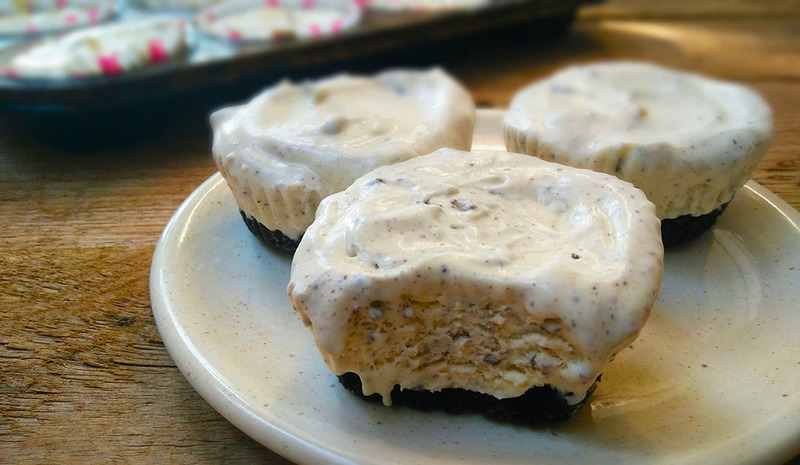 It sounds crazy, but it is necessary so that it can be evenly pressed into the muffin paper cups, which will form the base of these ice cream pies. Place the plain cookies in a ziplock bag and crush with a rolling pin. Empty the crushed cookies into a container Melt the butter and add to the crushed cookies. 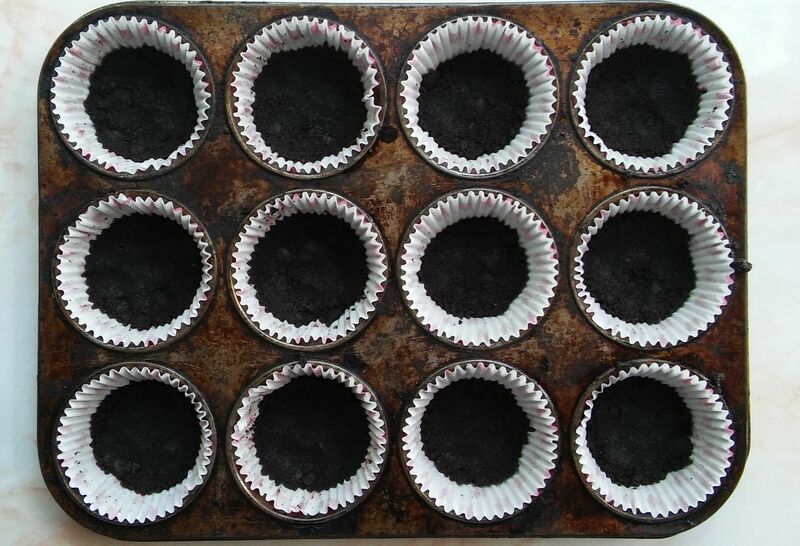 Press about a cm thick base into 12 muffin paper cases. Press evenly with the back of a teaspoon. The cream is then beaten until stiff peaks form and then added to the condensed milk and vanilla essence. 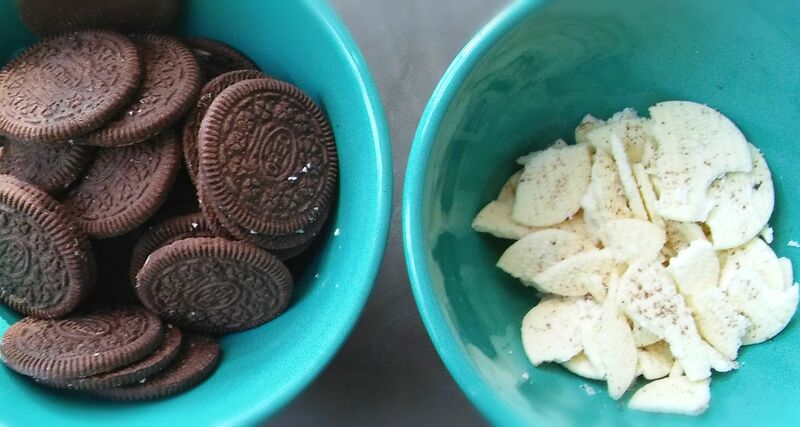 The cream which was scraped off the Oreo cookies is now also added now and then beaten until just combined. The remaining 4 cookies are now roughly crushed to fold into this mix. Pour this mixture into each paper case and allow to set in the freezer for about 2 to 3 hours. When set, peel off the paper cases and prepare to enjoy an amazingly delicious dessert. So go ahead and impress your friends and family with your own homemade ice-cream. 20 oreo cookies 16 separated and cream scraped off and 4 kept intact. Separate 16 of the cookies and scrape of the cream, I used a metal palette knife to scrape off the cream. Melt the butter and add to the crushed cookies. Press about a cm thick base into 12 muffin paper cases. Press evenly with the back of a teaspoon. Whisk together the condensed milk, vanilla and salt in a bowl and set aside. Whip the cream with a mixer on medium speed until firm peaks form, about 2 minutes. And just until stiff peaks form, don't over beat the cream because it will separate and be ruined, so just beat between a minute and a half to two minutes. Whisk the condensed milk mixture and the cream which you scraped off the oreo cookies into the whipped cream until well blended. Crush the 4 remaining cookies and fold into the blended mixture. Pour onto each base and allow to set in the freezer for 2 hours. 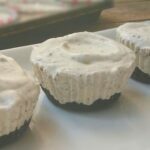 After it has set, remove from individual muffin paper cases and enjoy your delicious dessert. Thanks Patrick, yes it is…the flavourings are endless. They sound and look seriously rich and tempting! Thanks Angie, They are super tempting and addictive!! Thanks Deepika…These are great for summer, but here in my home they are in demand ALL YEAR ROUND ? I love no churn ice cream!! So easy!! And with the addition of Oreos?!! Yummy!!!! Thanks Kelly, Oreo’s really add the magic to this icecream! Just make sure that you get a few first before sharing…these disappear from the freezer superfast?. Have a wonderful week, Maria! These are so adorable and look super yummy! I love Oreo anything! Take care. Thanks Stacey, I am glad that you like the recipe. 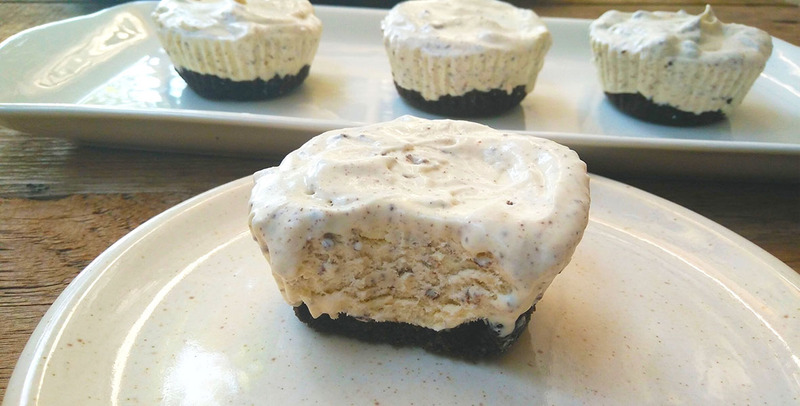 These are just the cutest little ice cream pies I’ve ever seen! I love that they’re small because that way I can eat more than one :). Have a great week, Ashika! Haha…I like the way that you think, Kelsie?. These are way too yummy anyway to just have one. Thanks Emma, homemade icecream really is the best. Trying not to eat the Oreo’s is seriously difficult?. I love making my own homemade ice cream and I love how you’ve even been so resourceful and scraped the cream off the Oreo’s! What a wonderful idea, I am absolutely drooling at these and thinking of all of the possible flavour combinations! Homemade ice cream really is the best. It was a Super difficult task not eating most of the cream before adding it into the icecream.? Oh my goodness, I really don’t know that I could trust myself to not just eat the cream. Whew. That will be a big test of will power!!! Loving no churn ice creams this year. Oreo!? Perfect.